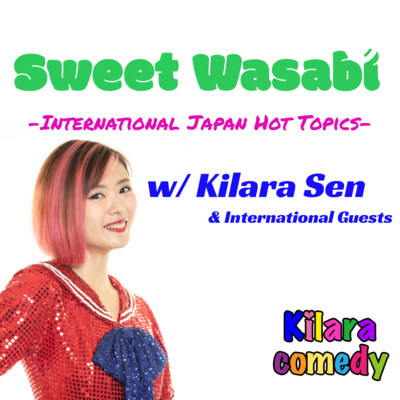 Kilara Sen (formerly known as Kaori), Japanese comedian, introduce Japanese cultures and news which Kilara and the world are currently interested in, live-recorded at Hard Rock Cafe Tokyo in Roppongi every Tuesday. Sometimes it might go controversial, but with international guests, this show would light up international society of Japan. We are always welcome you jump in to the live-recording!!! With a young Japanese standup comedian, we shared impressions against the viral video, "But we are speaking Japanese" . With Taylor Williamson, an American standup comic and America's Got Talent's vice-champion -the 2nd most talented guy in America (by Tayolo), we shared perspectives on Japanese new year customs, health insurance, and "Pokemon Shock". And Taylor shared his shocking and creepy incident in a Japanese subway. Such a special episode worthy of the name "New Year Special"!! Renato Rivera Rusca and I talked and discussed about Anime "A-CA-DE-MI-CA-LY". We deepened the topic and covered Peru, UK, and Japanese (political )backgrounds. It's a very interesting talk !!! Kilara shares a story about her performance at a huge Hanukkah ceremony in Tokyo. With the first Japanese & female guest for Sweet Wasabi, Ninja "OL" Polly, who is a 28-year-old office worker at a huge beverage company is going to share what "OL" life is like in this country. Although her story is personal, it should include the very reality of Japanese female working for a company. With Simon Gärdenfors, a very popular podcaster & standup comedian, we shared comedy backgrounds of each country. As Simon showed in his sitcom "My problems" , he is totally addicted with Japanese Ramen. His deep knowledge and love about Ramen should help your diet in Japan!! With Kim Andersson, one of the most successful comic artist in Sweden and now invited having his exhibition at the Swedish embassy in Tokyo, Kilara and Kim shared different perspectives of Manga culture. Now Japanese are even trying to marry to comic characters. With International Comic Festival around the corner, the two were so much excited at each different background!! While crazy things are happening, Kilara's personal life sometimes has faced Japanese sexism. Sharing her childhood story and current gender-free society, and discussed what Japan is going to be like with audience. November is the month of Samurai in Japanese saying. Kilara shared stories which are killing like Katanas (swords). Bringing a special guest Robert Scott, an American former professional baseball player, current actor. body trainer, and musician based in Osaka, the two talked about "Godzilla vs King Gidorah" which is Robert's one of the most major works. Also Robert gives tips for living and working in Japan based on his much professional careers. So many laughs, learnings, and Japanese dad jokes!! Also it includes Tokyo's event information of the week. Japanese Halloween these days often goes too far . Kilara shared her impression against the chaotic celebration. Also having a special guest all the way from Mexico, actor Raymond shared his experience in working for Japanese companies both in Mexico and Japan. Raymond is so handsome guy, so he's hot like chili. Me, I am hot like wasabi. We were supposed to have Daniel, a Swedish comedian for this episode. However having technical issues at the live recording, in this episode Kilara's monologue and Tokyo event information are recorded. Daniel will be back again!! We deeply apologize for the inconvenience. Fall is officially coming because I started wearing "Heat-tech" !! Shared my thoughts about "drunken Japanese salarymen" who are now representing Tokyo's night scene, and "dating" ! Includes exciting events around Tokyo information of the week!!! With having JJ, a Canadian comedian in Japanese-style as the guest, we share stories about Japanese comedians' life and how Japanese comedy known as Owasai is like!! The very 1st episode of "Sweet Wasabi" brings Kilara's events' co-host, Patrick Behuhuma from DR Congo!! With audiences' friendly joining, discussion about "Women Only Cars" and interesting stories about African family goes so fun!! !